Our ancestors had been saying for ages that milk is beneficial for the body when consumed daily in any form as milk, cheese or yogurt and when used externally on skin, hair in the form of soaps, shampoos, lotions etc. But question is which milk products – goat milk soap, cow milk shampoo, buffalo milk scrub or any other? Humans are created to sustain entirely on mother’s milk especially for the first six months of life. What after those six months and for the rest of life? Researchers have shown thermodynamic-ally as well as biochemistry wise; only Goat milk out of all available options is equivalent to mother’s milk. The pH balance of fatty acids in goat’s milk is similar to pH levels of human body, making it easy for beneficial nutrients and moisturizers in milk, to be absorbed into the skin. Goat milk soap acts as a natural cleanser and moisturizer; enriched with minerals and vitamins such as A, B6, B12, C, D, E etc. Along with a deep cleansing action it also has following properties. Anti Aging – Goat milk contains alpha – hydroxy acid such as lactic acid. Lactic acid essential for exfoliation, breaks skin cell bonds and removes dead skin cells layer. Thus leaving new cells on the top and hence a smoother, beautiful, and youthful skin. Chemical free – Most synthetic soaps contain harsh chemicals which can break skin cells leaving affects such of chemical burns. Whereas alpha hydroxy in goat milk helps in rejuvenation and repair of skin cells. It also prevents further damage to the skin. Anti Bacterial – Goat milk also delays the growth of microorganisms. Hence it has antibacterial properties and can prevent the spread of acne. Soaps with goat milk are used to treat acne as well as other skin diseases like eczema, psoriasis. Anti Inflammatory – Due to a high fat content, goat milk has anti inflammatory properties. The cream in milk helps in moisturizing and soothing dry and damaged skin. Prevents Skin Cancer – A mineral called Selenium present in goat milk prevents skin from sun damage as well as cancer. This rare mineral also plays important role in immune functions thus preventing skin from infections. Natural Moisturizer- Goat milk contains a high amount of natural emollients and triglycerides. These essential fats in milk nourish the skin by penetrating through the skin walls. Therefore, these organic soaps don’t dry skin instead keep it well hydrated. Therefore goat milk soaps act as perfect remedy for dry and sensitive skin especially during winters. Hydrant for Skin- The proteins and fats in goat milk penetrate the skin, then attract and hold water within them. This drawing of water into the actual cells leaves skin taut and firm. Hence these moisturizing and hydrating abilities of goat milk soap reduce fine lines and wrinkles. So concisely, goat milk soaps acts as a healing miracle for skin. 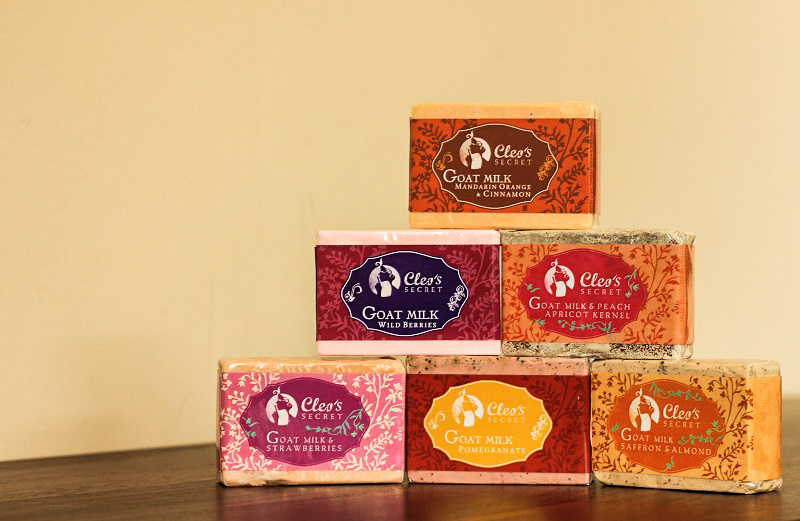 Regular use of goat milk soap leaves your skin healthier, nourished, young, vibrant and well mineralized. I love Goat’s milk soap, have since I was little. I used to suffer with severe eczema and it was the only soap that wouldn’t hurt my skin after. At least now they have better fragrant ones which I still can’t use but I am happy to see its varities and popularity. I had no idea that goat milk provides so many benefits for personal hygiene products! You make a great point that it provides lactic acid that is anti-aging and provides smoother and more youthful skin. My mom would love to have a product like this and I think I will have to get her some for Christmas! Also, the fact that it acts as a natural moisturizer is a huge benefit because I live in a dry area and my skin is often dry.